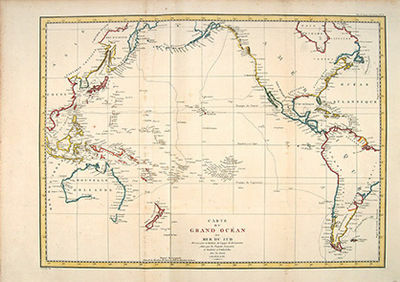 CARTE DU GRAND OCEAN OU MER DU SUD. Paris: , 1797. Copper engraving. Hand coloured. Very good condition. Faint waterstain along the left vertical fold. Very slight foxing, not affectong the image. Size: 68.5 x 49.5 cm. A splendid large chart of the Pacific Ocean, and of those countries that border it. Only coastal information is given. From the Voyages of La Pérouse who set sail from France in 1785 to continue the discoveries of Captain Cook. He was shipwrecked in 1788 but his narrative, maps, and views survived and were published in 1797. COSTUMES DES HABITANS DE LA CONCEPTION. 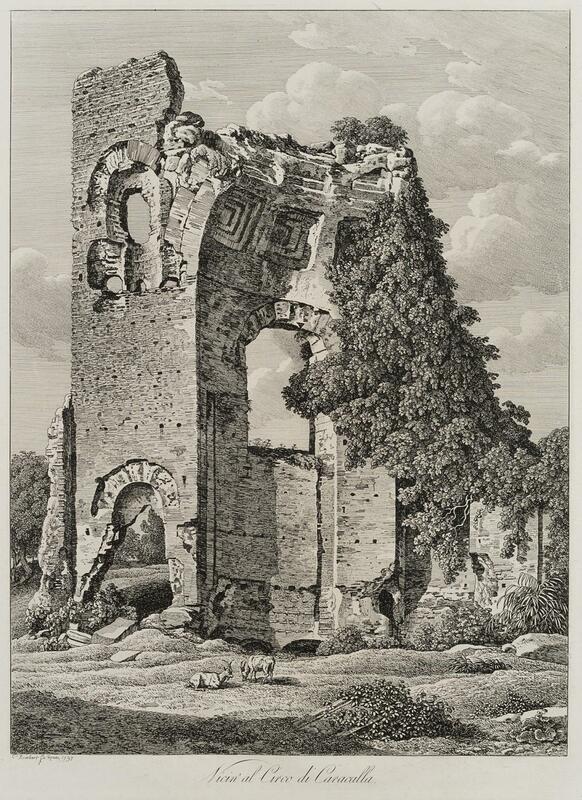 Paris., 1797.. Copper engraving. Uncoloured. Very good condition. 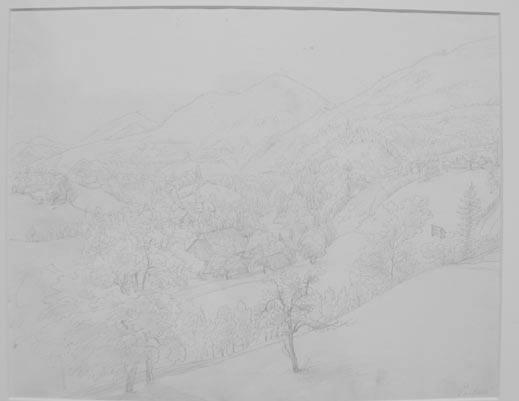 slight browing around edges but not effecting image Size: 40 x 25.5 cm. 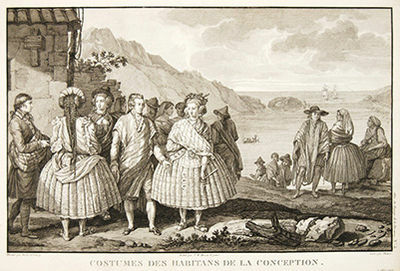 View of Chile showing the costumes of its inhabitants from the Voyages of La Perouse who set sail from France in 1785 to continue the discoveries of Captain Cook. He was shipwrecked in 1788 but his narrative, maps, and views survived and were published in 1797. Atlas Du Voyage De La Pérouse. CARTE PARTICULIERE DE LA CÔTE DU NORD-OUEST DE L'AMÉRIQUE reconnue par les Frégates Françaises LA BOUSSOLE ET L'ASTROLABE en 1786, 3e. Feuille. Paris., 1797. No.31. Size: 575 x 845 mm. Copper engraving. Hand coloured. Very good condition; some light stains along the lower horizontal fold; a tear and some foxing to the upper margin; wide margins. From the Voyages of La Pérouse who set sail from France in 1785 to continue the discoveries of Captain Cook. He was shipwrecked in 1788 but his narrative, maps, and views survived and were published in 1797. Thirty-eight years later the scattered remains of La Boussole and L'Astrolabe was discovered wrecked on a vicious reef on an atoll in the New Hebrides. Attractive sea chart covering coast from Mt. St. Elias to Monterey Bay. Relief shown by hachures. Shows route of La Perouse. Published in 'Atlas Du Voyage De La Pérouse'. Paris. 1797. - Copper engraving. Uncoloured. Size: 40 x 25.5 cm. Very good condition. slight browing around edges but not effecting image View of Chile showing the costumes of its inhabitants from the Voyages of La Perouse who set sail from France in 1785 to continue the discoveries of Captain Cook. He was shipwrecked in 1788 but his narrative, maps, and views survived and were published in 1797. Atlas Du Voyage De La Pérouse. N. Simrock [PN] 35, Bonna 1797 - Oblong folio. Disbound. 1f. (title), [i] (blank), 4-11, [i] (blank) pp. Engraved. Title printed within decorative border. Somewhat soiled; outer bifolium partly detached. Occasional markings in pencil. Second edition, first issue, published one year after the first. New Kinsky II, p. 167. 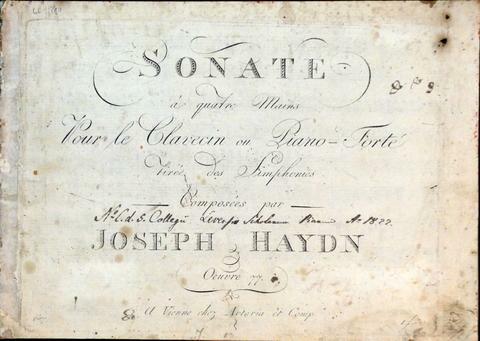 Hoboken 3, 626 (later issue).The theme is from Jakob Haibel's ballet "Le nozze disturbate. "One of the earliest Simrock publications. Sancti Aurelii Augustini Hipponensis Episcopi Operum. : Editio Tertia veneta. Ex Typographia Remondiniana, Bassano. 1797 - RARISSIMA EDIZIONE SETTECENTESCA (completa) DELLA OPERA OMNIA DI SANT&#146;AGOSTINO. Il primo volume correttamente con la bibliografia presenta una data di dieci anni posteriore probabilmente per un errore tipografico. Formato: 18 v. da 1000 a 2500 p. cad. 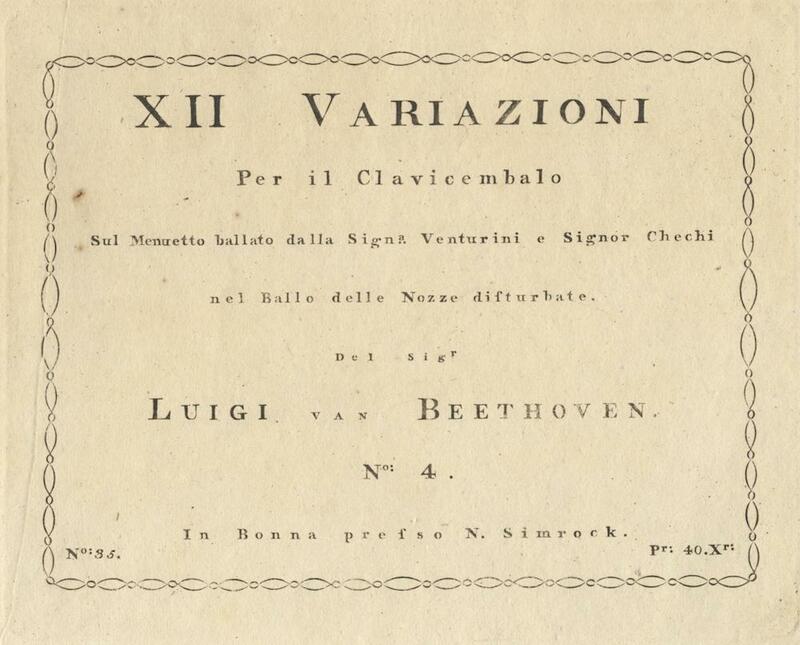 con numerazione su due colonne, 4° (29 cm), carta francese coeva con titoli a china al dorso del titolo, del numero di volume e degli argomenti contenuti in ciascun volume. Ordinari segni d&apos;uso e del tempo, cinque volumi presentano alcune gore non deturpanti alle prime carte, due volumi presentano limitate mancanze ai dorsi, il volume V presenta una macchia alle carte numerate romane che rapidamente si estingue alle prime arabe, che presenta alle prime 6 carte e alla brossura anche una limitata mancanza di testo. The Speeches of the Hon. Thomas Erskine, in the Court of KingÂ’s Bench, June 28, 1797, before Right Hon. 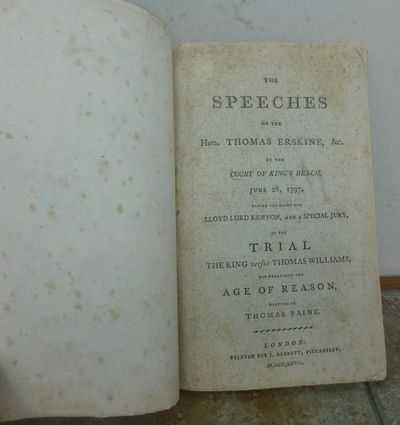 Lloyd Lord Kenyon, and a special jury, on the trial The King versus Thomas Williams, for publishing The Age of Reason, written by Thomas Paine. London, printed for J. Debrett, Piccadilly, MDCCXCVII. .. Pamphlet 1797, 8vo, 210 x 130 mm, 8¼ x 5 inches, pages: 23,  adverts to last page, marbled paper wrappers, title page and last page foxed, a few minor nicks to edges and occasional small fox spot, otherwise a good copy. MORE IMAGES ATTACHED TO THIS LISTING, ALL ZOOMABLE, FURTHER IMAGES ON REQUEST. POSTAGE AT COST. LA PÉROUSE, Jean Francois de Galaup. Ueber Geisternähe und Geisterwirkung oder über die Wahrscheinlichkeit daß die Geister der Verstorbenen den Lebenden sowohl nahe seyn, als auch auf sie wirken können. [Erster] und Zweyter Theil. [kmpl.]. [Einige Versuche] von G.E.W. Dedekind. 2. korrektere Aufl. u. Erstausg. Hannover, bei den Gebrüdern Hahn, 1793, 1797. - 9 Bll., 152 S. / X, , 196 S., Kl.-8°, Halbleder d. Zt. mit 5 Bünden goldgepr. Rückentext u. Farbschnitt (beide zus. in einem Bd.) 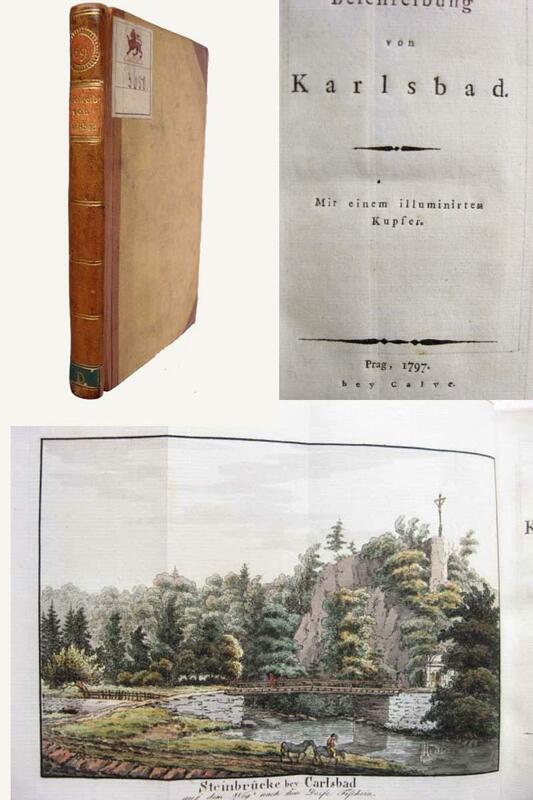 Bibliotheca Utopistica Hevesi 1510; Graesse 87; Rosenthal 1845; Slg. du Prel 925 (nur 1. Bd.). - Die EA des ersten Bandes war im gleichen Jahr, also 1793 erschienen. 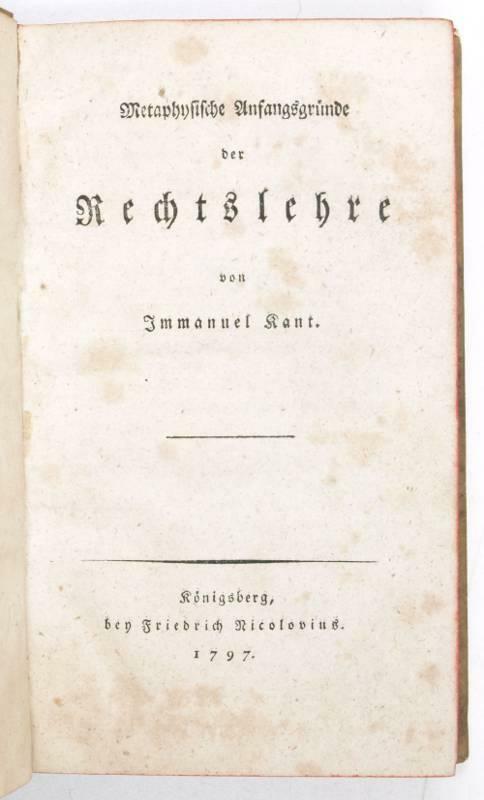 1825 wurden dann beide Bände "vereint", jedoch umfasst das Werk in dieser 3. Aufl. durch Neusatz deutlich weniger Seiten als in der vorl. 2bändigen Ausgabe. 1828 hat Dedekind (1764-1832) noch einen 3. Teil veröffentlicht, welcher jedoch sehr selten ist. - U.a. über: Ueber die Gewißheit der Unsterblichkeit; Etwas über die fortdauernde Verbindung der Geister der Verstorbenen mit der Erde u. mit ihren Bewohnern; Die Engel u. die zur Engelwürde erhabenen Geister der Vollendeten sind Schutzgeister der Menschen; Beantwortung der beyden Vorwürfe: daß die Lehre von einem beachtenden u. schützenden Einflusse der Engel u. der Geister der Verstorbenen auf uns u. unsere Schicksale, theils auf einen quaalvollen Aberglauben leite, theils der täglichen Erfahrung widerspreche // Daß unser gegenwärtiges irdisches Leben als unsere Bestimmung, als Zeck u. Absicht Gottes von uns angesehen werden müsse; Daß Jesus keinesweges durch den Tod in seiner Wirksamkeit auf Erden unterbrochen wurde; Wo ist der Himmel? ; Ueber die bisherige Lehre von einer Auferstehung des Fleisches; Ueber die Unvollkommenheit des Zustandes nach dem Tode. - Alter Ledereinband mit 5 Bünden u. Rückenvergoldung, die Deckel allerdings neu bezogen mit Pergamin, so dass es nun ein Halblederband ist; Rücken berieben; Vorsatz etwas fleckig; Titelrückseite mit sauber überklebtem Stempel; vereinzelt fingerfleckig; ein gutes Expl. - Komplett sehr selten. printed for G. Nicol, 1797. 8vo (cm. 21), 3 Voll., XVI-429 pp. ; XIV-383 pp. ; XVII-490 pp. Con tre grandi carte geografiche piÃ¹ volte rip. f.t. (un planisfero secondo la proiezione del Mercator e due carte itinerarie del viaggio in Cina). Legature coeve in mz. pelle rossa con fili e titolo oro al ds. (modeste abrasioni, tracce dâ€™usura e una mancanza alla cuffia superiore del secondo vol.). Qualche pallido alone, ma nel complesso ottimo esemplare. Prima edizione in questo formato, contemporanea allâ€™edizione in 4to (composta da due volumi ed un Atlante). Raro. 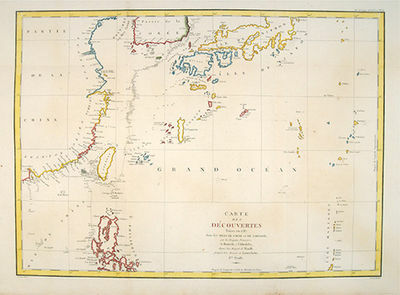 CARTE DES COTES DE L'AMERIQUE ET DE L'ASIE depuis la Californie jusqu'a Macao. Paris: , 1797. 3. Copper engraving. Hand coloured. Very good condition. Watermarks. Good margins. Size: 68.5 x 49.5 cm. A large and imposing sea chart of the North Pacific ocean. From the Voyages of La Pérouse who set sail from France in 1785 to continue the discoveries of Captain Cook. He was shipwrecked in 1788 but his narrative, maps, and views survived and were published in 1797. COSTUMES DES HABITANTS DE MANILLE. The Death of Cain, in five books; after the manner of The Death of Abel. By a Lady. The Third Edition. Paris: , 1797. Faites en 1643 par les Vaisseaux Hollandais le Kastrikum et le Breskens, Comprenant la Terra de Jeso l'Île des Etats et la Terre de la Compagnie, dont partie a ètè reconnue en 1787 par les Frègates Françaises la Boussole et l'Astrolabe. Size: 675 x 490 mm. Copper engraving. Hand coloured. Very good condition. A faint vertical waterstain. Good margins. From the Voyages of La Pérouse who set sail from France in 1785 to continue the discoveries of Captain Cook. He was shipwrecked in 1788 but his narrative, maps, and views survived and were published in 1797. An attractive map of the regions North of Japan withs two inset maps: Extrait de la carte publiee par Scheuchzer -- Extrait de la carte de l'Histoire du Japon de Kampfer. Relief shown pictorially; depths by soundings. Oriented with north toward right. Atlas Du Voyage De La Pérouse. Carte d'une partie du Gran Ocean a l'E. et.SE. de la Nouvelle Guinee. Paris: , 1797. Size: 490 x 340 mm. Copper engraving. Hand coloured. Good condition. Watermark, slight browning and an old repair to the central fold. Good margins. Interesting chart of part of the south-western Pacific, showing the routes taken by the Spanish explorer Don Francisco Antonio Maurelle in 1781 along the northern coast of New Guinea and across the Pacific to Fiji and Tonga. Maurelle was credited with the discovery of the Hermit Islands on this voyage. The map includes the north-eastern coast of Australia, and parts of the coast of New Guinea. 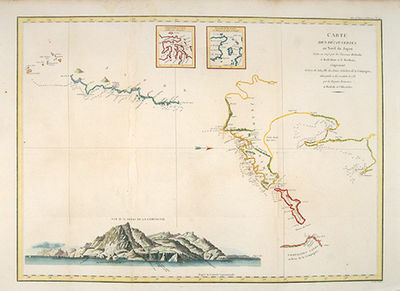 The map shows the 1781 route of his ship "The Princesa" through the Bismarck Archipelago north of New Guinea, through the Archipel de Salomos [i.e. Solomon Islands] and then east across the Pacific to the Iles de Amis [i.e. the Friendly Islands, now Tonga] where he discovered I. Vavao [ i.e. Vava'u] with one of the best anchorages in the South Pacific. 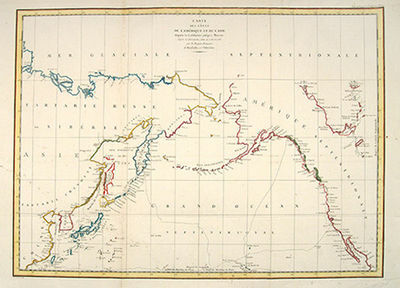 The map includes the Iles de Navigateurs [i.e. Samoa], I. Fidji [i.e. Fiji], Iles de Esprit [i.e. Vanuatu or the New Hebrides Isles], and Nouvelle Caledonie [i.e. New Caledonia]. Many small islands are depicted with notes regarding their sightings by Abel Tasman, William Bligh and Maurelle. A note on the chart states that the publisher has placed the islands according to the longitude of other navigators, rather than on Maurelle's figures which were considered estimates only, and also, that Maurelles chart was based on a French chart by Jacques Nicolas Bellin published in 1742. The French cartographers at the time did not consider the Spanish charts to be sufficiently accurate, so they preferred to make their own corrections. Jacques le fataliste et son Maître. Précédé d'un hommage aux mânes de l'auteur par M. Meister de Zurich. London: T. Cadell & W. Davies, 1797. Octavo, uncut, single leaf errata; in period style half red morocco. Influential study of the tales of Sindbad and their relation to the imaginary voyage.The poet and antiquary Hole (1746-1803) was a founding member of the Exeter Literary Society, to which he originally delivered this address on the question of historical antecedents to the Oriental tale. Although he begins sceptically, by the end he has talked himself around until he is seized by the belief that 'the narrative had a basis in truth' (DNB). The historian of the imaginary voyage Gove gives the work especial credit as one of the most 'valuable to the study of Sindbad as an imaginary voyage.'. A few spots but very good. Large 4to. London: R. Noble, 1797. Large 4to, viii, , 95,  pages; with 43 full-page engravings by Blake after his own designs surrounding the letterpress text. Half black morocco, marbled boards, a bit worn, internally very good despite some offsetting or show-through from the plates. First edition with Blake’s illustrations, complete with the leaf of “Explanations”. Essick and LaBelle explain in their commentary how Blake, virtually in a frenzy, completed 537 watercolor designs when he was commissioned by the publisher Edwards to illustrate Young’s masterpiece. 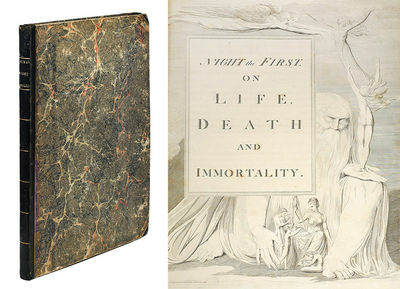 Edwards issued only the first four “Nights” (or sections) and had Blake etch and engrave 43 plates to test the market. The response must have been poor since no further engravings were requested of Blake and Edwards ceased business shortly thereafter. Ironically, today the poet Young, once compared with Shakespeare and Milton, is largely forgotten save for this edition. Colored copies are known in two palettes, the earlier of which may have been colored under Blake’s direction. Bentley, Blake Books, 515. Easson and Essick, William Blake Book Illustrator, vol. 1, IV. Essick and LaBelle, Night Thoughts, Dover, 1975. Bindman, Complete Graphic Works of Blake, 357-379. Ray, The Illustrator and the Book in England, 3. 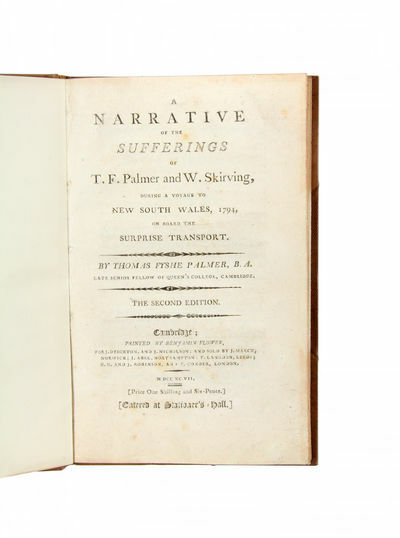 A Narrative of the Sufferings of T.F. Palmer, and W. Skirving, during a voyage to New South Wales, 1794, on board the Surprise transport..
Cambridge: Benjamin Flower, 1797. In very good condition.. Octavo, xii, 13-80pp. (last page advertisements), bookplate of F.G. Coles; originally stitch-sewn with the marks visible in the gutter, very good in polished tan half calf by Sangorski, red spine label. Second edition, revised and expanded with a newly printed letter to Governor Hunter: the most detailed and important eighteenth-century account of life on board a convict ship, written by a political thinker considered 'probably the most cultured of those who came to New South Wales in the early years of settlement' (ADB).This rare account was written by one of the famous Scottish Martyrs. Unlike the more commonly seen accounts of the trials of the Martyrs published in Scotland in the earlier 1790s, this work is a detailed description of the troubled voyage of the Surprise, a convict vessel sent to New South Wales in 1794. The account includes fascinating letters and petitions sent by Palmer and his colleagues from Sydney Cove. 'Contains the story of the inhuman treatment of Palmer and Skirving by Captain Campbell, master of the Surprise, following the malicious discovery, by [Scottish Martyr] Maurice Margarot, a fellow convict, of a sham plot for capturing the ship. Depositions of the surgeon and members of the New South Wales Corps against Campbell are included' (Ferguson). Influenced by the strong anti-Jacobin feelings of the time, Palmer and Skirving were alleged to have tried to seize the ship and sail it to France. In Sydney Palmer became a much-respected merchant and advocate for exploration. This narrative was taken back to England by Surgeon John White and prepared for publication by Palmer's friend, Jeremiah Joyce.This second edition is printed from the same formes as the first (with the minor addition of a footnote to the preface), but is important for the addition of the concluding six pages, "A Letter from Messrs. Muir, Palmer, and Skirving, to Governor Hunter" dated 14 October 1795, and also printing a note of receipt forwarded by David Collins. Perhaps rather overlooked, it should take its place among other great convict publications such as George Thompson's Slavery and Famine (1794), Thomas Watling's fabulously rare Letters from an Exile (1794), and Thomas Muir's Histoire de la tyrannie (1798). Provenance: The F.G. Coles copy, with bookplate, sold in 1965 for £80; private collection (Sydney). Paris., 1797. Copper engraving. Uncoloured. Very good condition. slight browing around edges but not effecting image Size: 40 x 25.5 cm. 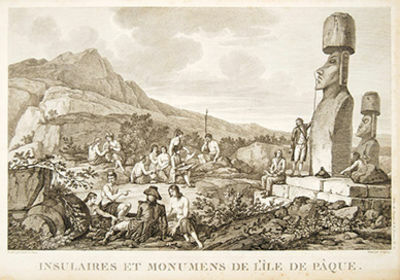 Beautiful print showing the locals and voyagers seated around the Easter Island figures from the Voyages of La Perouse who set sail from France in 1785 to continue the discoveries of Captain Cook. He was shipwrecked in 1788 but his narrative, maps, and views survived and were published in 1797. Atlas Du Voyage De La Pérouse. Wien : Artaria, PN 687, [1797?] - 29 S. Quer Gr. 4to. Ausgebunden, Rücken gering schadhaft. Titel fleckig. Inhalt leicht randfleckig. RISM H/HH 4415. Erstausgabe dieser Bearbeitung. Siehe auch Hob. XVIIa, Anhang. LES FABLES D'ESOPE, avec Figures d'apres Barlow. Recueil de Gravures piquantes et d'Apologues ingenieux pour l'amusement et l'instruction des Enfants. Par Augustine Legrand. Engraved frontispiece of Aesop talking to the animals. 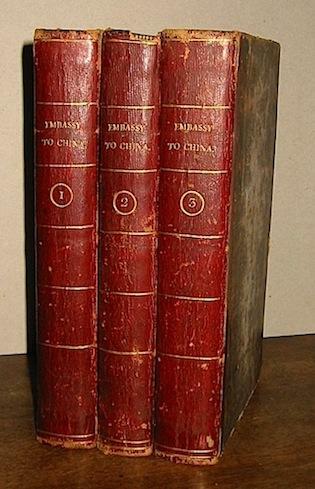 xij, 101 pages, including 50 full-page engravings after Barlow. Contemporary quarter calf gilt. Oblong: 186 x 220 mm. Re-backed with the original spine laid down; loss from two blank margins; expert repair to page 1; small split to spine; else an excellent copy of a scarce edition for children. Not in Gumuchian, though three other titles by Legrand are listed. [SCOTTISH MARTYRS] PALMER, Thomas Fyshe. Cambridge: Benjamin Flower, 1797. Octavo, xii, 13-80pp. (last page advertisements), bookplate of F.G. Coles; originally stitch-sewn with the marks visible in the gutter, very good in polished tan half calf by Sangorski, red spine label. Second edition, revised and expanded with a newly printed letter to Governor Hunter: the most detailed and important eighteenth-century account of life on board a convict ship, written by a political thinker considered 'probably the most cultured of those who came to New South Wales in the early years of settlement' (ADB).This rare account was written by one of the famous Scottish Martyrs. Unlike the more commonly seen accounts of the trials of the Martyrs published in Scotland in the earlier 1790s, this work is a detailed description of the troubled voyage of the Surprise, a convict vessel sent to New South Wales in 1794. The account includes fascinating letters and petitions sent by Palmer and his colleagues from Sydney Cove. 'Contains the story of the inhuman treatment of Palmer and Skirving by Captain Campbell, master of the Surprise, following the malicious discovery, by [Scottish Martyr] Maurice Margarot, a fellow convict, of a sham plot for capturing the ship. Depositions of the surgeon and members of the New South Wales Corps against Campbell are included' (Ferguson). Influenced by the strong anti-Jacobin feelings of the time, Palmer and Skirving were alleged to have tried to seize the ship and sail it to France. In Sydney Palmer became a much-respected merchant and advocate for exploration. This narrative was taken back to England by Surgeon John White and prepared for publication by Palmer's friend, Jeremiah Joyce.This second edition is printed from the same formes as the first (with the minor addition of a footnote to the preface), but is important for the addition of the concluding six pages, "A Letter from Messrs. Muir, Palmer, and Skirving, to Governor Hunter" dated 14 October 1795, and also printing a note of receipt forwarded by David Collins. 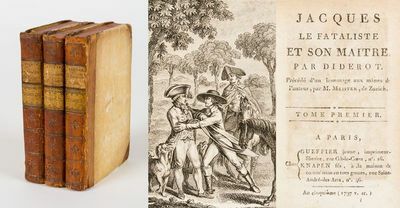 Perhaps rather overlooked, it should take its place among other great convict publications such as George Thompson's Slavery and Famine (1794), Thomas Watling's fabulously rare Letters from an Exile (1794), and Thomas Muir's Histoire de la tyrannie (1798). Provenance: The F.G. Coles copy, with bookplate, sold in 1965 for £80; private collection (Sydney). In very good condition. Paris: 1797 - Size: 490 x 340 mm. Good condition. Watermark, slight browning and an old repair to the central fold. Good margins. Copper engraving. Hand coloured. 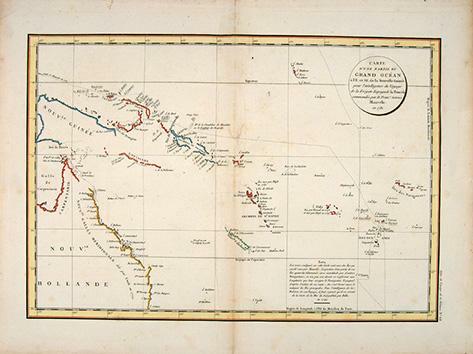 Interesting chart of part of the south-western Pacific, showing the routes taken by the Spanish explorer Don Francisco Antonio Maurelle in 1781 along the northern coast of New Guinea and across the Pacific to Fiji and Tonga. Maurelle was credited with the discovery of the Hermit Islands on this voyage. The map includes the north-eastern coast of Australia, and parts of the coast of New Guinea. 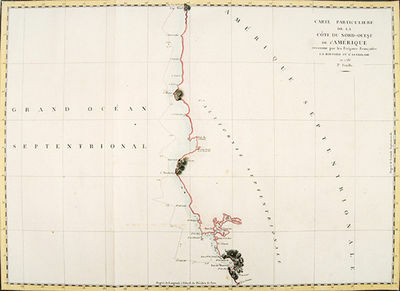 The map shows the 1781 route of his ship "The Princesa" through the Bismarck Archipelago north of New Guinea, through the Archipel de Salomos [i.e. Solomon Islands] and then east across the Pacific to the Iles de Amis [i.e. the Friendly Islands, now Tonga] where he discovered I. Vavao [ i.e. Vava'u] with one of the best anchorages in the South Pacific. 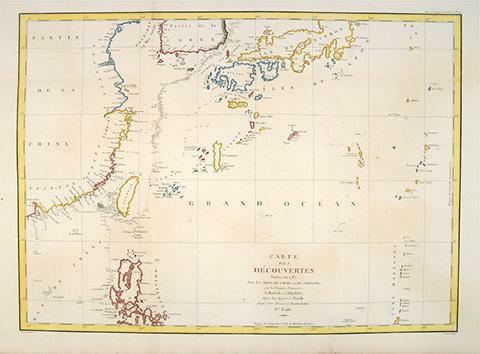 The map includes the Iles de Navigateurs [i.e. Samoa], I. Fidji [i.e. Fiji], Iles de Esprit [i.e. Vanuatu or the New Hebrides Isles], and Nouvelle Caledonie [i.e. New Caledonia]. Many small islands are depicted with notes regarding their sightings by Abel Tasman, William Bligh and Maurelle. A note on the chart states that the publisher has placed the islands according to the longitude of other navigators, rather than on Maurelle's figures which were considered estimates only, and also, that Maurelles chart was based on a French chart by Jacques Nicolas Bellin published in 1742. The French cartographers at the time did not consider the Spanish charts to be sufficiently accurate, so they preferred to make their own corrections. The beggar girl and her benefactors. In seven volumes. By Mrs. Bennett, author of Welch Heiress, Juvenile Indescretions, Agnes De-Courci, and Ellen Countess of Castle Howell. London: printed for William Lane, at the Minerva Press, Leadenhall-Street. 1797. 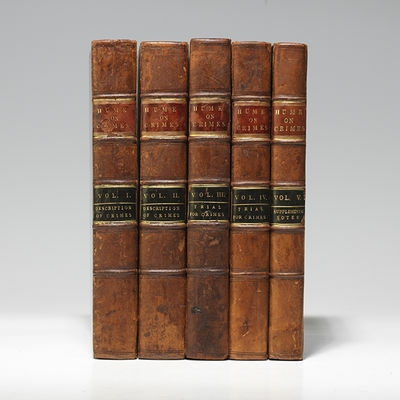 Seven vols. in three, 8vo., 271 + 316 + 270 + 357 + 306 + 338 + 414pp., together with title and contents leaves in each volume and, in vol.I, a 7-page dedication to the Duchess of York (i.e. 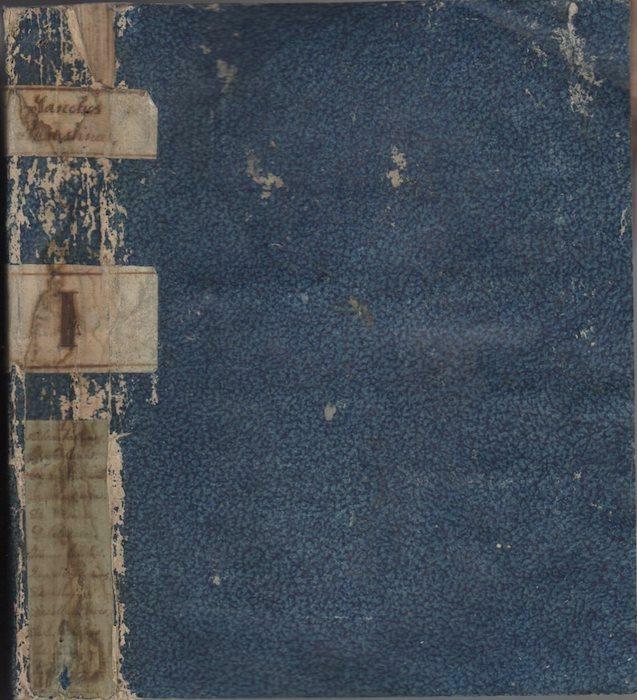 Princess Frederica Charlotte of Prussia), but wanting the page of advertisements at end of vol.5, a little variable staining here and there, two or three closed tears (no loss, however), in sound uniform 19th century bindings of half calf over marbled boards, the bindings rather worn but now repaired, new labels, with the 19th century bookplate of D.H. Gordon> on front pastedowns. A good and sound set. First editions. An inordinately long rags-to-riches novel about Rosa, a beggar girl, and her extraordinary journey through Georgian society. The Critical Review> makes some shrewd observations: 'Whenever quantity shall become the criterion of merit, we shall perhaps be able to estimate the value of this work more agreeable to the author's wishes than at present. If it be true, according to the Greek proverb, that a great book is a great evil, a great novel may be considered as the greatest of all evils. We do not, however, mean to say that there is little in this work to compensate its enormous extent; but we are apprehensive that readers of novels are not always gifted with the requisite patience to peruse seven volumes, in order to discover what might have been much better told in three. There are scenes of tenderness, delineations of character, and some attempts at humour, which will not fail to please: but, upon the whole, the story is eked out with a strange excess of digression, and with many superfluous characters.' Other critics were much more positive, however. 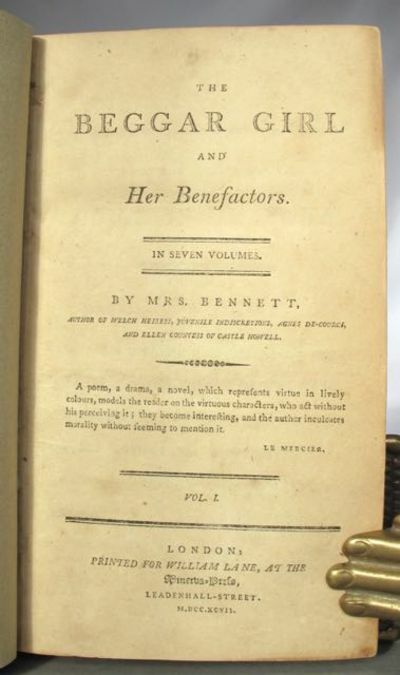 Scott had a copy at Abbotsford and Coleridge had a very high opinion of The Beggar Girl,> describing it as 'the best novel me judice since Fielding .....', while, more recently (1871) Mary Russell Mitford who refers to Mrs Bennett's 'prodigious quantity of invention ..... and, above all, the total absence of moral maxims ..... which give a freshness and truth to The Beggar Girl> which I never found in any fiction except that of Miss Austen'. [Blakey pp.53-54]. Perhaps The Beggar Girl> also qualifies as the longest English novel of the 18th century. Abhandlung über die leichteste und bequemste Methode die Bahn eines Cometen aus einigen Beobachtungen zu berechnen. 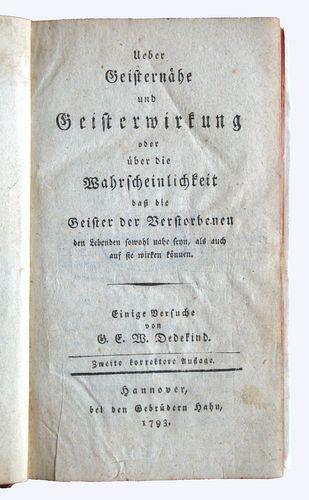 Weimar: Verlag des Industrie-Comptoirs, 1797. 1st Edition. Hardcover. 8vo - over 7¾ - 9¾" tall. 8vo (193 x 114 mm). xxxii, 106 (i.e. 96), 80 pp. Engraved folding plate bound at end, numerous letterpress tables. 20th century half calf over marbled boards, spine decorated in gilt and with gilt-lettered label (light rubbing of extremities, corners bumped). Text very fresh and crisp with only very minor spotting in places, plate with light soiling probably due to printers ink. Provenance: Augustiner Convent, Münnerstadt (two small stamps and shelf-numbers to title-page). Nice copy. ----Houzeau-L. 11965; Poggendorff II, p.320; DSB X, p.198. - RARE FIRST EDITION. Olbers developed a new method for calculating a comet's parabolic orbit. "In a letter to F.X. von Zach (1754-1832), director of the newly founded observatory on the Seeberg, near Gotha, Olbers asked weather his treatise on this method should be printed, and if so, how this could be done. After reading the treatise and using it with ecxellent results to compute the orbit of the comet of 1779, which had presented great difficulties to many astronomers, von Zach decided to see it through the press himself. It appeared at Weimar 1797" (DSB). Mit dieser Abhandlung begründete der Bremer Mediziner Wilhelm Olbers (1758-1840), der sich nachts in seinem Privat-Observatorium astronomischen Studien widmete, seinen Ruf als einer der besten Astronomen seiner Zeit. Er hatte 1796 einen neuen Kometen entdeckt und eine Methode zu dessen Berechnung entwickelt. Sie löste die bis dahin üblichen langwierigen und häufig ungenauen Berechnungsarten von Euler sowie La Place ab. Eine zweite, von J. F. Encke berichtigte und erweiterte, wesentlich häufigere Auflage war erst 1847 erschienen. Very Good. 1797. Signed. NAPOLEON. Letter signed (""Bonaparte""). Milan, August 11, 1797. 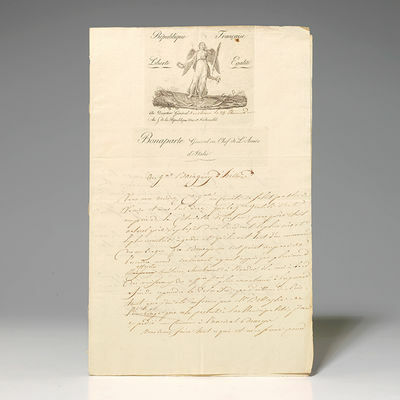 Folio, single sheet of Napoleon's pictorial engraved letterhead, folded in half, measuring 9-1/2 by 14-1/2 inches; pp. 2. $8500.Letter signed by Napoleon, written in a secretarial hand on the vignette-engraved stationary of General Napoleon Bonaparte's Army of Italy, boldly signed ""Bonaparte"" by Napoleon. A fine piece on Napoleon's beautifully engraved stationery.The document, written entirely in French, dated August 11, 1797, and sent to General Baraguey d'Hilliers, concerns the Napoleonic Wars' Northern Italian and island campaigns. Having conquered Venice in May, Napoleon here writes to d'Hilliers, the new French governor of that city, instructing him to communicate to the leaders there the current position of General Gentili in Corfu. He also asks d'Hilliers to inform them that Admiral Brueys has furnished his ships with experienced officers in order to retake Dalmatia. Napoleon expresses his wishes regarding the new Cisalpine Republic, which he had established in Northern Italy. He closes by reminding Governor d'Hilliers to be strong and to encourage his officers. The letter is boldly signed ""Bonaparte"" in Napoleon's own hand. This scarce version of his signature, ""Bonaparte,"" was used by Napoleon only between 1796 and 1804; he changed it in 1796 from the Italian spelling ""Buonaparte,"" when he became head of the Army of Italy, in recognition of his position as head of the French army conquering Italy, and after he was crowned Emperor, he signed his name ""Napoleon."" Document in French. Signature exceptional. About-fine condition. 1797. First Edition . MORGAN, William. 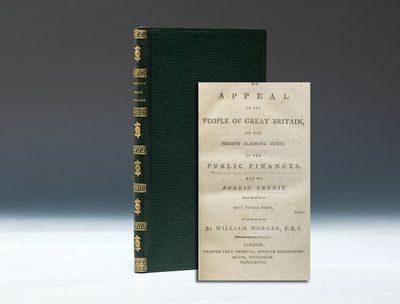 An Appeal to the People of Great Britain, On the Present Alarming State of the Public Finances, and of the Public Credit. 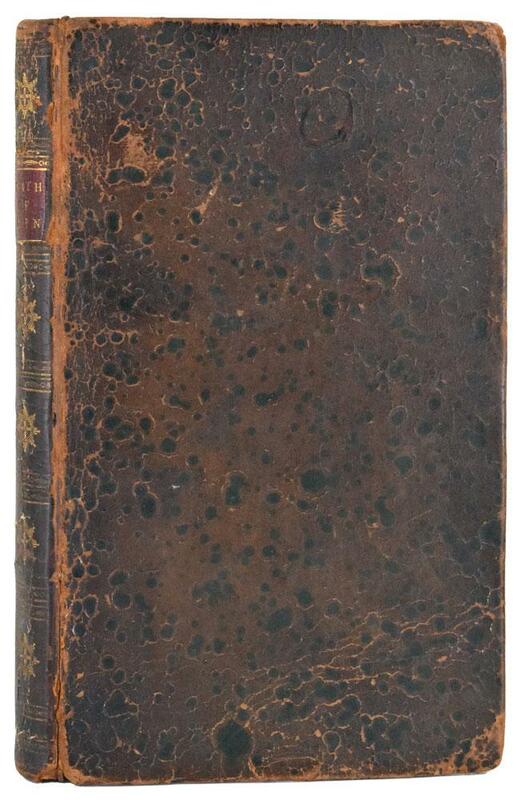 London: J. Debrett, 1797. Slim octavo, period-style full green straight-grain morocco gilt; pp. 87. $3200.First edition of William MorganÂ’s fearless attack on the political and economic cost of British policies in Â“that detestable warÂ” against America, a major work by the first modern actuary, one of Â“the pioneers of scientific life assurance in England (ODNB) and nephew of British radical Richard Price, Â“the most influential advocate of American independenceÂ” (Howes). Jefferson, who became Vice President the year this work was published, had a first edition in his library.William Morgan Â“ranks high among the pioneers of scientific life assurance in EnglandÂ” (ODNB). He was the nephew of famed radical Richard Price, Â“the most influential British advocate of American independenceÂ” (Howes P586), and it was Price who encouraged MorganÂ’s appointment as assistant actuary to the Equitable Assurance Society in 1774. On MorganÂ’s swift rise to chief actuary in February 1775, he quickly Â“became well known as Â‘Actuary Morgan,Â’ the man who made the reputation of the EquitableÂ… the intellectual master of political arithmetic and the éminence grise of insurance, the true father of old age pensionsÂ” (Harte, in Crabtree Orations, 231). Morgan Â“was the first to show how to work out complicated benefits, involving several lives, from any mortality table; the first to value the liabilities of a life assurance company and appreciate the meaning of the result; the first to see that, with the valuations in use, a margin of surplus had to be carried forwardÂ… the first to set down the available sources of profit and obtain measures for them; the first to keep record of the mortality of a life assurance office, and to notice that there was such a thing as Â‘selectÂ’ mortality. Further than this, he was the first practical administrator of life assurance and a successful man of businessÂ” (Elderton, Â“William Morgan, F.R.S.,Â” 15). This scarce first edition of MorganÂ’s Appeal speaks not only to his mathematical brilliance, but also his fearlessness in attacking Britain for its aggression in the American Revolution, arguing: Â“the growing extravagance and folly of fourscore years had loaded the nation at the commencement of the American war with a debt of more than 135 million; and at the conclusion of that detestable war, the public burdens had been aggravated with an additional load of 120 millionÂ… The bubble has swollen till it has burst, and we are now brought to the edge of a tremendous gulfÂ” (emphasis added; 28, 81). MorganÂ’s home was a popular meeting place for Â“other radicals associated with Richard Price; John Horne Tooke, Sir Francis Burdett and Thomas Paine were among those who joined the lively gatherings at Stamford HillÂ… In 1794 when Horne Tooke and others were indicted for treason, Morgan escaped with a warning from the authoritiesÂ” (ODNB). Three years later Morgan nevertheless issued this warning about the dire economic and political costs of British aggression. Thomas Jefferson, who became AmericaÂ’s Vice President the year MorganÂ’s Appeal was published, had a first edition of it in his library. Morgan, who also shared with Joseph Priestley a strong interest in science, is additionally credited as Â“the first experimenter with X-rays, 110 years before they were brought in 1895 into prominence by RöntgenÂ” (Anderson, Â“William Morgan and X-Rays,Â” 219). With several full-page tables; MorganÂ’s preface dated in print, Â“April 8, 1797.Â” Page of publisherÂ’s advertisements at rear and on title page verso. GoldsmithsÂ’17046. Kress B3469. Sowerby 2832. ESTC T528. See Sowerby 2807. ESTC shows 31 copies in institutions, including the Library of Congress, Cambridge, the British Library, Oxford and Harvard. Text quite fresh, beautifully bound. , 1797. 1797. Signed. NAPOLEON. Letter signed (""Bonaparte""). Milan, August 11, 1797. Folio, single sheet of Napoleon's pictorial engraved letterhead, folded in half, measuring 9-1/2 by 14-1/2 inches; pp. 2. $8500.Letter signed by Napoleon, written in a secretarial hand on the vignette-engraved stationary of General Napoleon Bonaparte's Army of Italy, boldly signed ""Bonaparte"" by Napoleon. A fine piece on Napoleon's beautifully engraved stationery.The document, written entirely in French, dated August 11, 1797, and sent to General Baraguey d'Hilliers, concerns the Napoleonic Wars' Northern Italian and island campaigns. Having conquered Venice in May, Napoleon here writes to d'Hilliers, the new French governor of that city, instructing him to communicate to the leaders there the current position of General Gentili in Corfu. He also asks d'Hilliers to inform them that Admiral Brueys has furnished his ships with experienced officers in order to retake Dalmatia. Napoleon expresses his wishes regarding the new Cisalpine Republic, which he had established in Northern Italy. He closes by reminding Governor d'Hilliers to be strong and to encourage his officers. The letter is boldly signed ""Bonaparte"" in Napoleon's own hand. This scarce version of his signature, ""Bonaparte,"" was used by Napoleon only between 1796 and 1804; he changed it in 1796 from the Italian spelling ""Buonaparte,"" when he became head of the Army of Italy, in recognition of his position as head of the French army conquering Italy, and after he was crowned Emperor, he signed his name ""Napoleon."" Document in French. Signature exceptional. About-fine condition. De vismarkt aan het Damrak, in de achtergrond stadhuis en waag.Ets en aquatint naar het ontwerp van Thomas Rowlandson, uitgegeven door Rudolph Ackermann in 1797. In de tijd met de hand gekleurd. ZELDZAAM. Afm. 41 x 54 cmOp deze pittoreske voorstelling zien we in de voorgrond visboeren in een tiental boten druk met hun manden en netten. Een steiger loopt naar de eigenlijke vismarkt. Aan de overkant van het water liggen grotere boten aan het Damrak. Op de Dam staat nog de waag uit 1565, die door Lodewijk Napoleon in 1808 werd afgebroken, omdat het zijn uitzicht vanaf het tot zijn paleis herbestemde stadhuis, zou belemmeren.Gebouwen zijn tamelijk nauwkeurig weergegeven, de figuren losser, bijna karikaturaal, een genre waarmee Rowlandson (1756 -1827) beroemd zou worden. Maar tot het eind van de 18e eeuw maakte hij meer objectieve beschouwingen van het stadse en landelijke leven, vaak met glimlach.Op de plaats van de vismarkt staat sinds 1914 De Bijenkorf.Prijs: ?3.950,- (incl. 21% BTW, incl. lijst). Carte des découvertes. Faites en 1787 dans les MERS DE CHINE et DE TARTARIE, par les Frègates Françaises la Boussole et l'Astrolabe, depuis leur Dèpart de Manille jusqu'à leur Arrivèeau Kamtschatka. 1.ere Feuille. 1797. First Edition . HUME, David. Commentaries on the Law of Scotland Respecting the Description and Punishment of Crimes. Two Volumes. WITH: Commentaries on the Laws of Scotland Respecting Trial For Crimes. Two volumes. WITH: Supplemental Notes to Mr. Hume's Commentaries on the Law of Scotland Respecting Crimes. Edinburgh: Printed for Bell and Bradfute [and for E. Balfour for first two works], 1797, 1800, 1814. Five volumes altogether. Large quarto, contemporary full brown calf, raised bands, red and black morocco spine labels. $6500.First edition of Baron HumeÂ’s groundbreaking authoritative Commentaries on the Description and Punishment of Crimes, the Â“standard work on Scottish criminal lawÂ” (DNB), together with first edition of his two-volume Commentaries on Trial for Crimes, and exceedingly scarce first edition of his Supplemental Notes. Rarely found together, a seminal five-volume work by the nephew of philosopher David Hume, laying Â“the foundations of our modern criminal law,"" uniformly bound in contemporary calf. ""A landmark event in Scottish legal history occurred in 1797 when Baron David HumeÂ… published his Commentaries on the Law of Scotland Respecting the Description and Punishment of Crimes"" (Hewitt, Symbolic Interactions, 1). A revered Professor of Scots Law at University of Edinburgh, with achievements that include his appointment as Baron of the Scots Exchequer in 1822, Baron Hume was ""influenced by the views of his uncle, David Hume, the philosopher, with whom he had a close friendship. The elder had supervised his education"" (Criminal Law, 47n). Baron Hume ""laid the foundations of our modern criminal law"" (British Justice, Hamlyn Lectures). This rare complete five-volume set of Commentaries, including the rarely found Supplemental Notes, provides ""the classic statement of Scottish criminal law"" (Kilday, Women and Violent Crime, 32). With this groundbreaking ""standard work on Scottish criminal law"" (DNB), Baron Hume ""carried the torch into all the recesses of actual practice. He not only made himself familiar with all the scattered matter that had been published, though much of it lay hid in places not commonly explored; but he was the very first who went systematically to the records"" (Edinburgh Review 83:197). To Sir Walter Scott, Baron Hume was ""an architect Â… to the law of Scotland' (Scott on Himself, 42). Hume's lectures at the University of Edinburgh provided the basis of these works.To his contemporaries the Commentaries and Hume's authoritative research into ""the rise and progress of this lawÂ… will ever be held to communicate the most philosophical views of the criminal law in a popular and perspicuous manner"" (Edinburgh Law Journal, I:485). Hume importantly highlights, as well, ""the differences between Scottish and English laws, shaping the former into a symbol of cultural and national identityÂ… for England's 'bloody code' of hundreds of offenses punishable by death did not extend to Scotland. The differences were celebrated in Hume's Commentaries"" (Hewitt, 52, 44). ""The first study of judicial decisions"" in Scottish criminal law, Commentaries has been officially ""afforded 'authoritative' status"" (Gibb &amp; Duff,Criminal Justice Systems, 7). Hume particularly focused on common law. Like ""Blackstone and Bentham in England, Kames and Hume in Scotland were intensely engaged by the question of whether and how the common-law system of maintaining continuity through precedent, and of accommodating change through reinterpretation, could meet the demands of 18th- and early 19th-century BritainÂ… As Farmer explains, 'The belief that the law matured in the late 18th century, taking the form of liberal and flexible principles [was] set out clearly for the first time by Hume. Hume affirms the sense that the past had been leading more progressively to a more enlightened presentÂ… A lasting result of Hume's book and its outlookÂ…. strongly implies the autonomy of criminal law from the rest of culture"" (Bardsley, Belief and Beyond, 235-239). ""Indeed Hume still has high status in Scottish legal history. According to WalkerÂ…. 'his examination, based on primary sources [is] invaluable"" (Bardsley, Yale Journal of Law &amp; the Humanities, V14 (2002):238-9, 20-21n). Commentaries (1797) with title page imprints, ""Edinburgh: Printed for Bell &amp; Bradfute, Booksellers to the Faculty of Advocates; And for E. Balfour."" ""Another issue of this work appeared in 1797 with the imprint: Edinburgh: printed for Bell &amp; Bradfute; and E. Balfour"" (ESTC T98602): no priority established. Harvard Law Catalogue I:967. Marvin, 405. Edinburgh Review 139:267. ESTC T98600; T98602; T98601. See NYU Catalogue, 251. Interior fresh and clean, only light edge-wear, minor rubbing to spine labels of boards. A near-fine set, rarely found complete and uniformly bound in contemporary calf.